SEO is increasingly maturing in the organization and with increased resources, budget and technology adoption occurring in the last year, expectations are that it will grow even further in 2013. Search’s influence in the organization has grown to such an extent that search is now found second most commonly in its own separate department, something unheard of only a few short years ago. 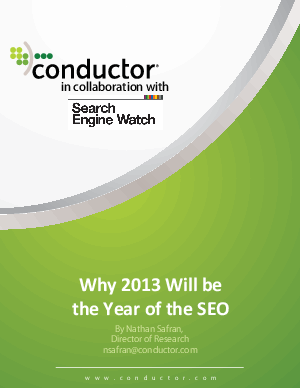 Check out this whitepaper to learn how leveraging SEO technology can grow your organization’s online market share in 2013.